Was Problem-Solving on your list of soft skills? I can’t say that it was originally on mine. Why is that? I think that we tend to think of soft skills as “positive”. Soft skills are there to present an upbeat environment that everything is okay. It is an improvement mechanism. A reference to problem-solving suggests that there are indeed problems— and that’s a downer. No one wants to go there! That’s just my thought, what is yours? The reality is that no matter your role or the industry you work in, you will encounter problems. How you handle them will go a long way in determining your level of success. It will also determine how you manage the relationships and shared goals you have with your team and/or organization. In researching this topic I turned to my fairly substantive bookshelf of management and leadership books, looking for words of wisdom. I was actually quite surprised to find that there was not all that much, and what was there was not much help. I then turned to one of my favorite sources of leadership inspiration, Canadian astronaut and author Chris Hadfield. His book, An Astronaut’s Guide to Life on Earth (Random House Canada, 2013), is full of leadership gems and sure enough, lots of problem solving object lessons. For Hadfield, one of his learnings was to “anticipate problems in order to prevent them… how to neutralize fear, how to stay focused and how to succeed”. My favourite quote though is this: “…we learn[ed] to ask ourselves. ‘Okay, what’s the next thing that will kill me?’”. Most of will not have to ask this a question as radical as this, but it illustrates that problem solving is as much proactive as it is reactive. First you need to define the problem: Take a holistic view, look at the big picture, and take time to examine it from as many perspectives as possible. Collect as much data about the problem as you can. This will slow down the process, which among other things, can help prevent volatile emotions from taking over and potential conflicts from happening. Another consequence of slowing down the process is to make sure that the problem is clearly defined so that you end up actually solving the problem and not just creating a temporary stopgap measure. 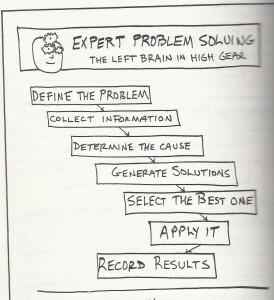 Once you’ve defined a problem, you can start to generate solutions. Don’t stop at one — look for a second solution, a third, maybe even a forth. Each time you search for an additional solution you delve deeper into the problem, which can create opportunities to uncover additional issues and/or highlight unintended consequences. You may come to the conclusion that the first solution was the correct one, but having examined additional ones gives you an added level of surety. As you select the best option, check your own emotional stance to make sure you are not favouring one solution over another simply because it is yours. Here is where the soft skill of communications and teamwork come into play. Finally, be certain, once you have implemented the solution, to evaluate the results. Did the solution generate the desired outcome? Did it cause any unintended consequences? The answers to these questions will help determine your course of action in any future similar circumstance.